A small but vital genre of homebrew portable computers is the "cyberspace deck," in which hackers create DIY, special-purpose computers inspired by the ICE-breaking console-cowboy decks of William Gibson's Sprawl trilogy (Neuromancer, Count Zero, Mona Lisa Overdrive). 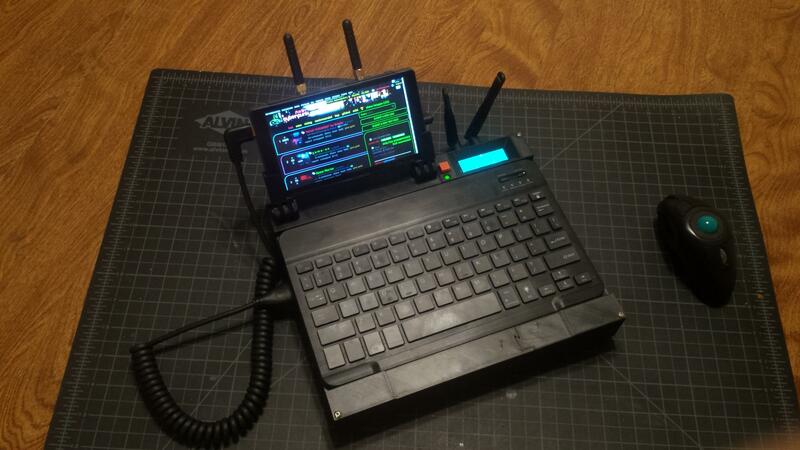 Last year, I wrote about the Commute Deck, a portable wireless Unix terminal created by Kerry Scharfglass. Now, there's Tinfoil_Haberdashery's "Cyberdeck," revealed in all its glory on /r/Cyberpunk, inspired by classic laptops like the COMPAQ Grid Compass 1011. Tinfoil_Haberdashery 3D printed the chassis with interlocking dovetails, added a head-mounted display, and a pop-up screen with stubby antennas. It's a gorgeous little simulacrum! I started with components--the Intel NUC is a 4"x4" motherboard form factor designed to be used in a mini desktop. However, the fact that it will happily run on a wide range of voltages and uses virtually no power makes it a perfect candidate for a portable build. This one has a 3.4ghz duo core CPU, and I added 8Gb of RAM and a 500Gb M.2 SSD. The NUC can also take on an external graphics card via its Thunderbolt port if I decide to add that in the future. My screen is the Fatshark Transformer, a 5" 720p display intended for FPV drone piloting. It works as a standalone monitor but also slots into single-panel and binocular headsets, so I can use it as a regular head-mounted display with full resolution or get 3D video at half-res. I designed and 3D-printed the case. Due to the build-volume constraints of my printer, I had to break the body and lid of the case up into 4 pieces each, print them separately and then glue them together afterward. Here's the top-left corner of the case where the motherboard sits, as designed for printing. I designed the case as a whole, then broke it into pieces so that I didn't have to second-guess my measurements.